SERIOUSLY my saving grace when it comes to online shopping is Amazon Prime Shipping. I frequently shop on Amazon Prime. There have been Amazon Deals and it saves me from having to leave my home to grab gifts, necessities, and wants! What Do You Receive with Amazon Prime? My Favorite thing about Prime is the TWO DAY shipping! I will request something Wednesday (like the time I had a broken toaster) and get it back Friday. Sometimes I don’t even have enough time to run to the store to get that product my house is in need of. This makes Prime perfect for my home! Pick up FREE Prime Instant Video access for paid or free trial members in the U.S. and Puerto Rico. The resources above (including your home computer) allow you to watch your favorite shows and movies at home or on the go! Kindle Owners’ Lending Library access to members in the U.S. For more information, go to Kindle Owners’ Lending Library. 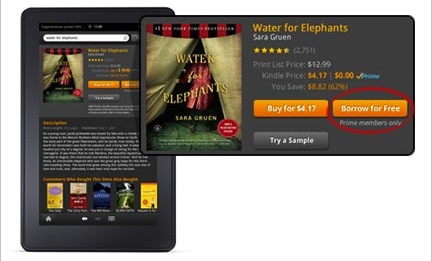 This allows you to get or share MANY Kindle books for FREE! Receive all the benefits of Amazon Prime including FREE Two-Day shipping for eligible purchases, FREE access to Instant Video, and the ability to borrow books from the Kindle Owners’ Lending Library with a FREE 30-Day Trial! You may choose to keep for the price of $79 a year or cancel if this service is not for you! Cancel anytime. Love Movies? Don’t forget the Redbox Movie Streaming and the FREE Trial to Netflix! Click the banner below to get started on your FREE Trial today!